1. There has been a lot of reporting and angst over the possibility that India will turn to coal to electrify the country (many in India still lack electricity). While the government may well initially deploy coal in a kind of ‘all of the above’ strategy, the fact is that solar photovoltaic electricity generation is already cheaper than that from imported coal. And the price of solar panels in India is dropping. 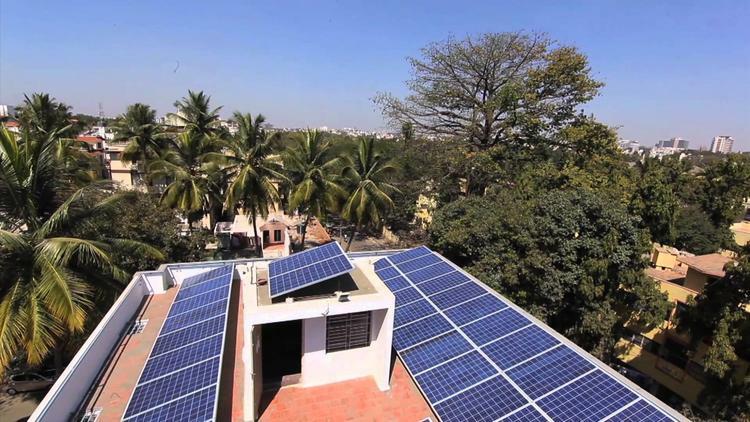 The good news is that India’s solar energy production has crossed the 3 gigawatt threshold. Installations are expected to double next year, i.e. to increase by 1.6 gigawatts. Some investors were waiting to see how the parliamentary elections turned out, while others were eyeing the government’s coal policy. With the strongly pro-solar BJP government now in power, the sector is expected to experience good growth next year. The government wants 100 gigawatts of solar energy (nearly 3 times solar leader Germany’s current capacity) to be produced annually by 2020. 2. India has 7 times as much wind energy, so far, as solar, with 21.6 gigawatts. But by the end of next year, wind will be generating 25 gigawatts, and by the year 2020 it is expected to be generating 50 gigawatts. Wind is so attractive as a way of making electricity in India that there is a virtual gold rush of private investment in it. The major Indian corporation Tata alone expects to add 0.3 gigawatts of capacity annually for the next few years. Wind turbines have been getting bigger and more efficient in recent years. 3. France, which had lagged in renewable energy, is making big plans for it now. It only has 5 gigawatts of solar-generated electricity, compared to 37 gigs in Germany. Solar accounts for 1% of French electricity, compared to 7% of Germany’s. But French firms have determined that new solar installations can generate electricity more cheaply now than new nuclear installations (a development that had not been expected until 2020). Neoen just broke ground on a 300 megawatt solar PV facility near Bordeaux, the biggest in Europe! 4. In the first nine months of 2014, Germany got more electricity from renewables than from any other source, including nuclear or coal, at 27.7 percent of demand. Its carbon emissions will fall in 2014, in contrast to the dirty-energy US. Although some complain that Germany has spent $130 bn on its Energy Switch since 2000, that is less than $9.2 bn a year in a rich country of 82 million people (i.e. the energy switch so far cost about $113 per capita per year, or about 2 Starbucks lattes per person every month every year since 2000). At least one day this year German electricity generation produced more money than it cost, which is the future. In contrast the US spends between $10 bn and $50 bn a year on fossil fuel subsidies, which are damaging our health and our planet’s health, so Germany obviously has the right idea in comparison. By 2035, Germany expects to more than double the share of renewables in its energy mix, to 60%. On present evidence it is likely to get there sooner. 5. South Africa is not resting on its laurels. Having brought the 98 megawatt Jasper PV solar power plant on line already, it is planning a 100 megawatt Redstone concentrated thermal plant, which will be the largest in Africa. South Africa is presently heavily dependent on coal, but plans to import 2.6 gigawatts of hydroelectric power from the Congo and to increase use of renewables. 6. A new technical breakthrough at UC San Diego could make concentrating solar power plants like Jasper in South Africa 30% more efficient (which is to say, allow them to generate electricity much more cheaply). If you take into account the damage fossil fuels do, solar and wind are already much cheaper for society. But increasingly they will be less expensive even if you don’t count externalities, because the pace of technological innovation in renewables and in battery storage is accelerating rapidly as more government and venture capital money pours into this sector. Already, French energy firms are admitting that a new solar plant makes more economic sense than a new nuclear one. In a decade, it will be crazy to build anything but a renewable power plant, just purely on the competitive price. But all it will take is a few obvious climate disasters (a rapid rise in sea level e.g.) for the public to start demanding a ban on fossil fuels, making it even easier and faster to implement renewables. We’re going to warm the world more than 3.6 degrees F., which is sad. But we don’t have to warm it all the way to 10 degrees F., which we will do if we run through all the coal, oil and gas in the world as we presently plan on. An increase of 10 degree F. might not be survivable for the human race, which evolved in substantially colder conditions.